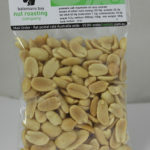 The Batemans Bay Nut Roasting Company has been cooking and selling nuts up and down the South Coast of NSW and in Canberra for the past 20 years. Our longevity in Business, we believe, comes from the result of using the Freshest Kernel available. (Australian wherever possible.) EVERYTHING is GLUTEN AND DAIRY FREE except the Kri Kri Peanuts. 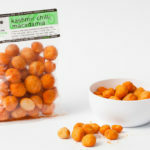 Australian (NSW) Macadamias. 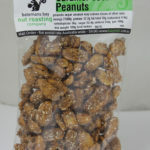 Our most popular nut!! Available in 100g and 375g bags! These are the nuts you see and smell me cooking at the Markets. 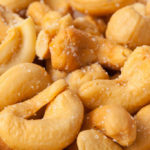 Cashews, Lightly Salted or Caramelised with the added taste of Natural South Coast honey make a popular treat. Australian Cashews are not readily available hence ours are Vietnamese. Mark, we’ve been a customer of yours, for the past 16 years. We consider you and Xia friends. We purchase nuts from you for many reasons. The freshness, first up, the camaraderie, and originality of flavours would have to be a major plus also. More so, yours is a journey and business we just love to invest into. You’ve done well my friend. Frank and Elaine, Guerrilla Bay. The only reason we come to the Moruya Market is to buy nuts from you. Julia and Sam. Newcastle, NSW. Every Kiama market, for the past 10 years, your Nut Stall, and its aromas have been a part of our life. It is due to you that my kids now love to eat nuts! You have made nuts fun, and healthy too! Well done, and we wish you the best. 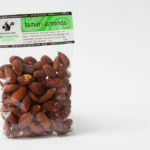 South Australian Almonds, grown Insecticide free, dry roasted with Tamari. (A wheat free low salt soy) Great with wine. 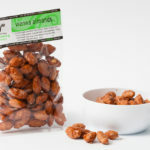 South Australian Almonds, grown Insecticide free, caramelised with a hint of Cassia Cinnamon. A very traditional Nut. Great crushed up on Icecream! 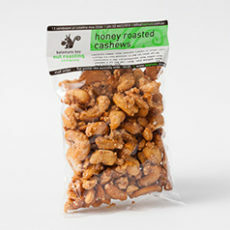 Vietnamese Cashews, caramelised with the added taste of Natural South Coast honey. A popular treat. Vietnamese Cashews freshly roasted with Macadamia Oil and an added hint of salt. 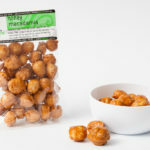 Australian (NSW) Macadamias roasted with Macadamia oil, with the added flavours of Green Mango powder, Cummin, Lime, Chilli and a pinch of salt! Think savoury, think middle east. 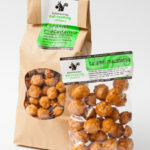 Caramelised Australian (NSW) Macadamias. 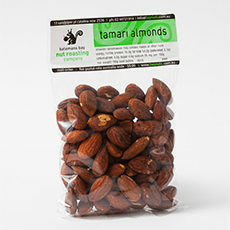 Our most popular nut!! Available in 100g and 375g bags! These are the nuts you see and smell me cooking at the Markets. 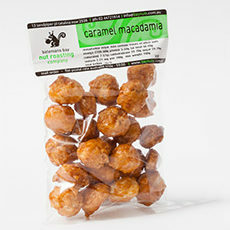 Australian (NSW) Macadamias roasted with Macadamia oil, with that definite Garlic flavour. Like me, a favourite of the ladies! 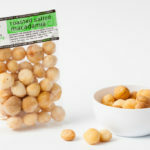 Australian (NSW) Macadamias roasted with Macadamia oil. Surprisingly nice and nothing like a Salt n’ Vinegar chip. A favourite for sure! 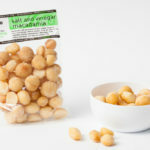 Australian (NSW) Macadamias roasted with Macadamia oil and a pinch of salt. 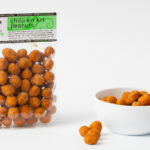 Australian (NSW) Macadamias, roasted with Macadamia oil, with a subtle taste of Wasabi and 100% Australian Farmed Seaweed. 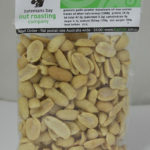 It’s not hot, and our most popular savoury nut. Winner of the Bronze Medal at the Australian Food Awards in Melbourne in 2016. 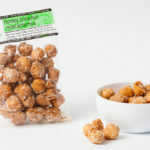 Macadamia covered with a coating of local South East Honey and topped off with Coconut! A great Summer Nut! Available in 375g also. Kri Kri is an Asian style of cooking an Australian Peanut. It has a crunchy coating (wheat based) on the outside. Great with Beer. 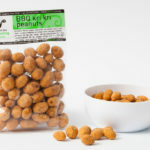 Australian “Kingaroy peanuts” caramelised. Peanuts and sugar, that’s it! Like me, sometimes, simple is best! 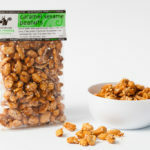 Australian “Kingaroy peanuts” Caramalised with a “summery” dose of Coconut. Who would have thought such a blend would taste simply sensational! Kingaroy Peanuts with a slight dosing of salt. Simply Great and always fresh! 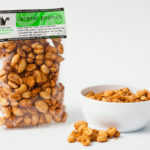 Australian “Kingaroy peanuts” caramalised with a generous dose of toasted sesame seeds. My most popular caramelised peanut! 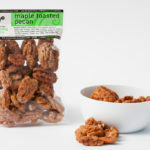 Australian Pecans from Moree NSW with “Pure” Canadian Maple Syrup. A decadent treat. Great in salads even!